NEWTOWN, Conn.––A book of daily devotions for first responders of all denominations has been distributed to fire fighters, police officers, EMT personnel and other community servants in Boston, West, Texas, and Newtown, Conn. Strength for Service for God and Community, a pocket-sized book of 365 devotions, is patterned after a 70-year-old Strength for Servicer to God and Country written by pastors and educators for troops during World War II. Over one million copies were distributed before the book was discontinued in 1954. Twelve years ago, it was republished by Evan Hunsberger, a California Boy Scout. A total of 460,000 copies of the revised edition have been distributed, primarily to troops in Iraq and Afghanistan. The same team that helped Hunsberger raise funds and distribute the books developed the new volume with entirely new meditations for those in the service of others. Royston Bailey, president of New York Annual (regional) Conference of United Methodist Men, took 250 copies of the book to fire fighters and police officers who responded to the tragedy at Sandy Hook Elementary School where 20 children and six adults were killed. “This book is a tool to help the mind, soul and spirit find peace,” said Bailey in an April 28 presentation to three first responders at Newtown United Methodist Church. Rob Sibley, Ken Carlson, and Bob Virgalla, who were among those who responded to the Dec. 14, 2012 tragedy. Jon Christensen, a member of the church, coordinated and introduced giving the books to the three first responders. “This book to going to be very meaningful,” he said. The first responders “will use it. They’ll rely upon it. They’ll bring additional copies to their respective first responder units and to all of the eight units here in town.” He felt that it was important for the first copies to be in a worship service. “It will mean a lot to the church” in the ongoing care for Newtown’s first responders. 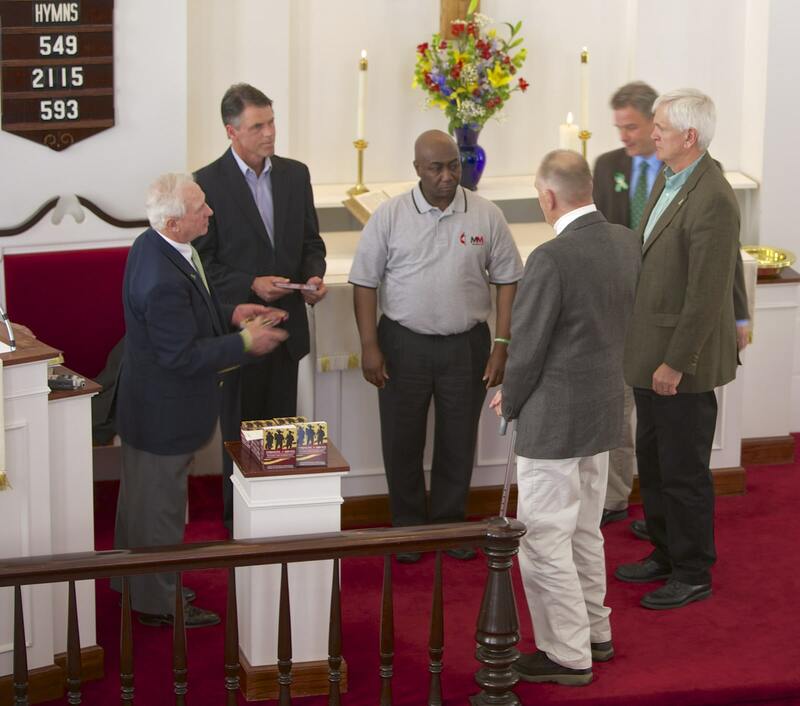 “As soon as the first responders received the books the congregation stood and applauded them, for an extended period of time . One hundred copies of Strength for Service to God and Community were also sent to the Massachusetts Council of Churches. Churches received free sample copies and were invited to purchase additional copies for first responders in their faith communities.